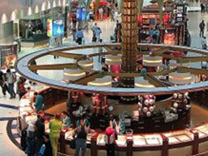 This again is an orientation tour on Dubai's shopping wonders. Begin with a halt at 'City Centre' one of the biggest malls in Deira Dubai, after which we proceed to Bur Dubai for a short walk through 'Bur Juman' shopping center. After visiting both the malls we proceed to explore the bargains at the Gold Souq and savor the aroma of exotic spices while strolling through the spice souq.